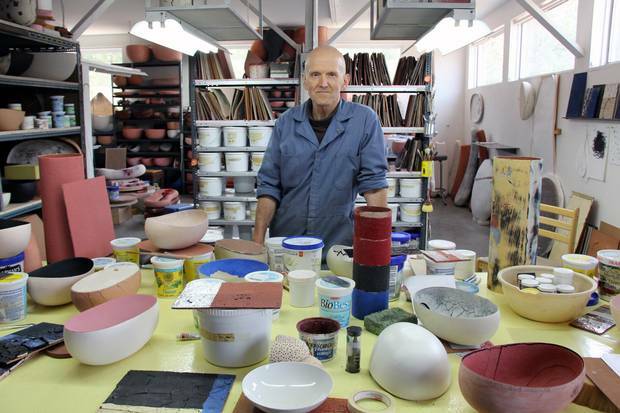 Steven Heinemann in his studio. 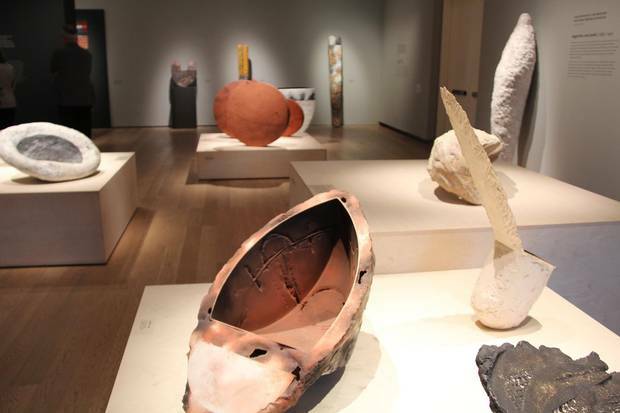 The full scope of Culture and Nature – the Gardiner Museum's deeply satisfying retrospective of Canada's most artful ceramicist, Steven Heinemann – is captured in one of the first pieces on display. Given that the show is roughly chronological, it's some testament to the intensity of Heinemann's understanding of his medium: Even in the first steps of his career, he was exploring veins that still reveal richness in their depths 30 odd years later. The piece, in any case, is Mimbres, which certainly deserves to be, if it is not already, one of Heinemann's signatures. It looks a bit a like a flat rock with a perfect 90-degree bend on one end; it rests, almost teetering, on that bent edge, huddled around the empty space created by this unnatural geometry. It is, in its most direct viewing, a clever bit of formal expression, part of a series of "negatives" Heinemann was making in the 1980s, inspired by the moulds he was using to create other shapes at the time. It's a consideration of the there-but-not-there-ness of classic ceramics such as bowls – the way they are forms that shape what is around and within them, as much as they are shapes themselves. Mimbres might be described as a rock that turns the air around it into water, the ethereal internal space it creates extending out much like ripples, repeating its form through space. Mimbres, 1985, one of the first pieces on display, was inspired by the moulds Heinemann was using to create other shapes in the 1980s. Circling and staring at it, though, these ripples start to expand well beyond the room. Its external side, such as it can be said to have one, is lumpy and natural – less a rock, maybe, than a relief of a worn-down mountain range. But the idea of geography shrunk down doesn't linger. Even among these natural forms, there's the touch of human fabrication, a clear division of planes cutting through the clay, a sense of pieces being bonded. This is only enhanced when you return your view to the internal, which features not only that perfect bend, but a circling target pattern, a reference to the millennia-old pottery style – the only remains of the Indigenous people who lived in the southwestern U.S. Mimbres Valley – that gives the piece its name. So, in one piece, Heinemann has had us reconsider the idea of a bowl, has made the earthy origins of his material manifest and has spoken directly to the deep history of his tradition – a tradition, he also reminds us, that in some cases serves as the definitive, if not only, marker of human civilization, period. The divine does not much factor into the presentation of Culture and Nature, nor Heinemann's work itself, but it might be the most apt reference for his ability to imbue life into hunks of clay. 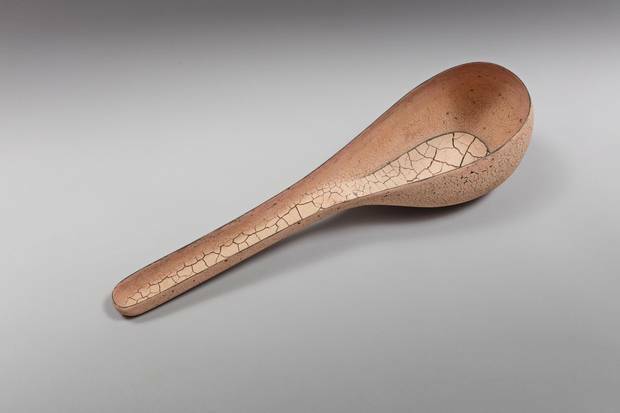 In any case, the best of Heinemann's work does seem to play in similar scales: He has a way of seeming to compress geological time and space into a bowl, letting the natural settling of the clay stand in for the cracking and withdrawal of the earth. A portion of the Steven Heinemann collection at the Gardiner Museum. Steven Heinemann, Borealis, 2012. Slipcast earthenware 72 x 58 x 49 cm. The Raphael Yu Collection. This becomes quite explicit in alteredstates, a digital work that shows a time lapse of a piece of ceramic fading into and out of a kind of weathered, beaten valley, but it's suggested even in the works that aren't moving. A piece such as Residuum, a slightly misshapen blue bowl, looks as if you have caught a stone in the middle of evolving: In its curves, cracks fade into the distance like a written record, while the closest, freshest chunks of clay look as alive but fragile as scabs, waiting to be peeled back to reveal what is growing underneath. At other times, Heinemann makes his presence more explicit, creating patterns in the spreading cracks. These are often fairly playful. 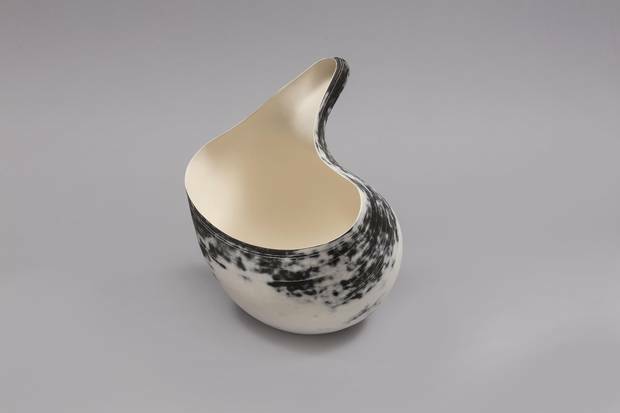 Then and Now is a black-and-white piece that features a drawing of a bowl tipped, with its contents apparently spilling into the real bowl its embedded in. Playa (Self-portrait) features Heinemann's own thumbprint in the middle a bowl. It feels a bit like a knowing smile toward all the less meticulous craftspeople who have left their own inadvertent marks. Yet, even here, deeper ideas emerge, from the nature of bowl-ness to the nature of humanity and our eternal need to leave something on behind us. 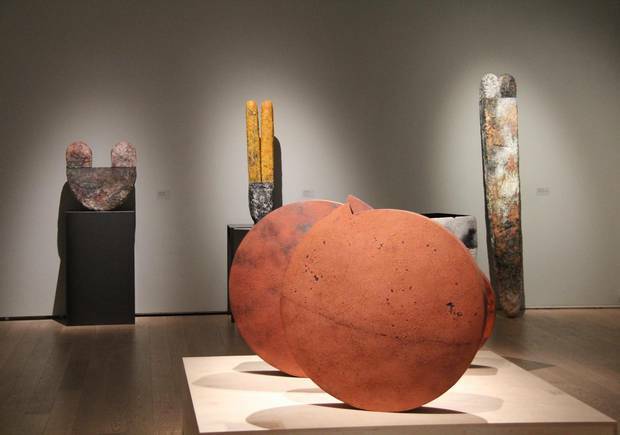 Steven Heinemann: Culture and Nature runs through Jan. 21 at the Gardiner Museum in Toronto. Steven Heinemann, Little Dipper, 2004. Slipcast earthenware, multiple firings 20 x 73 x 19 cm. Collection of Jacques and Gabrielle Israelievitch. That latter drive is one of the strongest echoes through the show, a background beat that ties together the ideas of nature and culture nicely, insomuch as culture is our continuing attempt to leave our mark on nature. (History shows us that nature always wins, given a long enough scale.) Some of Heinemann's most effective pieces play with this, especially by drawing some clear connection to the infinite: Bowls such as farawaysoclose, which features a series of emerging moons, or Has Bean, an oblong black-blue piece, suggest the night sky, as though you could flip them and stare into the great beyond, wondering about your place in it. One of the strongest pieces might be one of the most subtle, though. 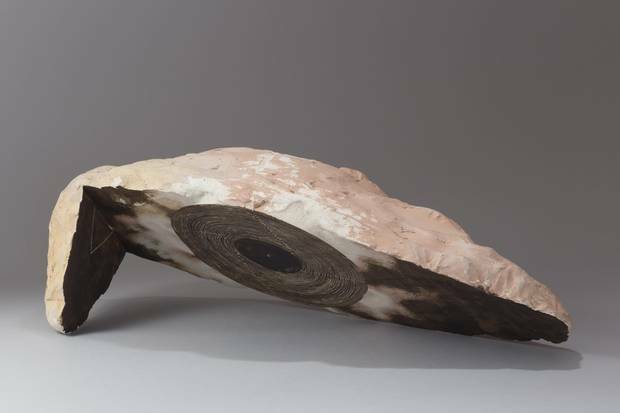 Untitled (Rocking Form), from 1993, is a four-foot-tall half-circle, white with stretches of black, that doesn't really reveal itself until you appreciate it from different perspectives. From a distance it is, again, a natural texture made into a shape just uncanny enough to remind you it has been created. The top part of it is cracked into pieces, like slate. The bottom is gentler, though, especially once you focus on it: The surface is undeniably stony, but almost supple, as though it has been gently eroded into place. Heinemann has a way of seeming to compress geological time and space into a bowl, writes David Berry. Stepping back again, the work of a human hand is undeniable and the two parts seem to suggest a more melancholy interplay. Maybe it is that to touch something is to erode it, to take a piece of it with you and leave it slightly lesser. It's an undeniable inversion of the idea of making something from clay, but it gives the piece a more profound weight, especially as your eye moves from the gentle bottom, up to the cracked top and finally into the space above the sculpture entirely, the space where the rest of the circle should be. It seems to suggest that every act of creation is in some sense also one of destruction, that entropy is pulling on us even as we push these pieces of clay into place. If that is the case, as least Steven Heinemann has left a tremendous body of work to be appreciated, while it lasts. 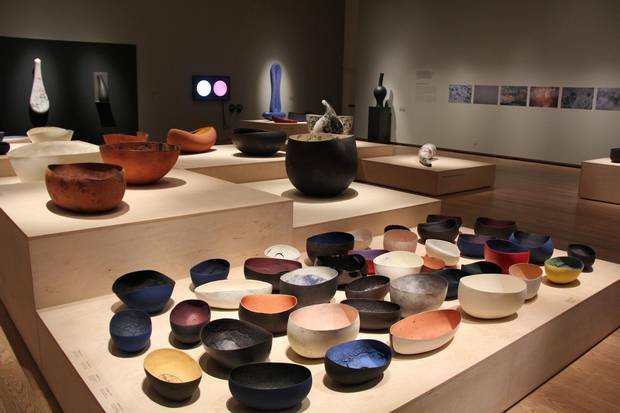 Steven Heinemann: Culture and Nature runs through Jan. 21 at the Gardiner Museum in Toronto (gardinermuseum.on.ca).